Growing up in Kingscliff, Australia, Nyree’s early start with animals came from following around her father, who was the local veterinarian and kept his practice just next door to the family home. This also made it really easy for her to keep a large array of cats, dogs, rats, and budgerigars while growing up as well as pursue her passion for horseback riding, through which she competes regularly in dressage classes still. Upon finishing high school, Nyree packed up her gear – including the horse – and headed off to the university, where she majored in Wildlife Sciences. After graduating and working in veterinary clinics and doing behavioral analysis with the humane society for cat and dog adoptions, it was her time spent volunteering at Currumbin Wildlife Sanctuary where Nyree began spending more time around birds. There, she was able to observe some incredible breeding projects in action, such as those for the Coxen’s and Double Eyed Fig parrots. This proved to be an entrance suitable only for a life less ordinary, as Nyree became an intern with ABI and its project in Brazil in 2013. She believes the Brazil Amazon trip with ABI would have to be one of the highlights of her life. 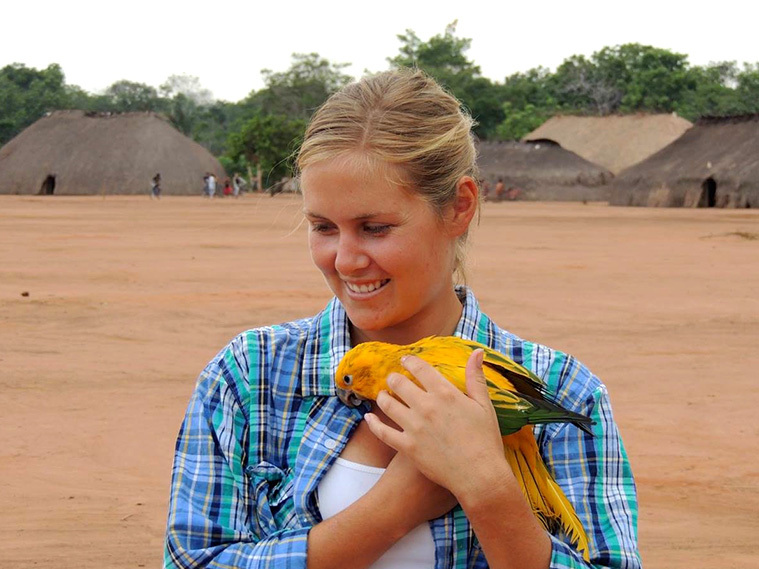 Nyree enjoys working with birds because of the multi-layered aspects of avian behavior and also the intelligence of many species, particularly parrots. She believes there is always something new to learn about avian behavior and enjoys developing a trusting relationship with the birds at ABI.